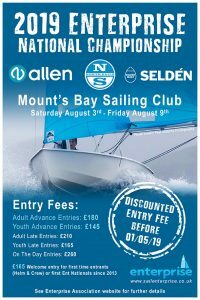 The Event runs in conjunction with the Osprey National Championships, from 3rd to 7th August. This is bound to add to what already promises to be a great week socially. If you haven’t attended a Nationals before then why not give it a go. The Nationals Championships allocates positions and prizes across Gold, Silver and Bronze divisions. Your division will be determined by your experience and performance at the beginning of the week. Everyone comes together to race and to share experience and skills that allow fellow competitors progress. Our number 1 priority is to have a good time enjoying great racing and socials. Mounts Bay offers excellent sailing afloat combined with a great family holiday destination, providing all the ingredients necessary for a great week for sailors and non-sailors alike. The Club house is situated opposite the picturesque St Michael’s Mount, the bar terrace provides fantastic views across the wide sandy beach and bay beyond, where our racing will be held. The week starts with a Pasty and Pint welcome on Saturday evening. Throughout the week you will have: a guided tour of St Michael’s Mount, Live Band, prize giving Disco and a Meal on the final evening. Our new Automated online Entry form makes registering easy so don’t delay, Enter now !